Web series! YouTube channels! Comedy shows set in space! There are a billion of them these days, all screaming for your attention. Some are amazing, some are not so amazing. I would very much like to introduce you to a web series that I firmly believe is QUITE GOOD. Full disclosure. It’s one of mine. I’ve made a few. I have a problem. Ladies and gents, I give you The Away Mission. It’s silly. It’s very, very silly. 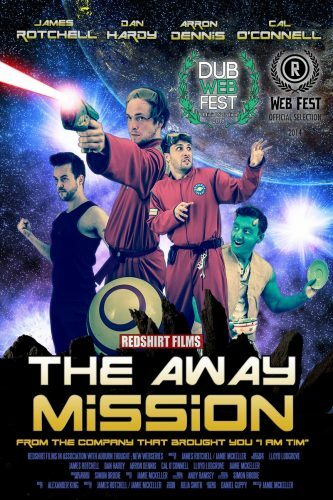 Seven episodes of half naked red uniform wearing crew who were tragically forgotten during a routine away mission. Mystery burgers, space balls, back flipping captains with the mandatory ripped vest and aliens portrayed by people painted green. One half of the writing team is a huge Trekkie, and although the tropes pop up we did our best to steer clear of using certain words like “RedShirt”, “Kirk” or “Enterprise” but you’ll easily spot the parallels if you know your Tribbles from your Tellarites. The full first season has a full run time of around 27 minutes, which is two decent cups of tea or 1/7th of Fellowship of the Ring. It would be an absolute delight to hear what you make of the show. If you’d like to get right up in our social madness, check us out all over the internet. If you find yourself at MCM London next month, we’ll be there shooting a cosplay video and hanging out in the VidFest zone. Come find us and get a high five, and whisper the phrase “Geek Pride Rules” to be handed a free t-shirt. We’ll have a few with us each day, first to find us bags them in all of their nerdy splendour.